Organic Materials as Smart Nanocarriers for Drug Delivery presents the latest developments in the area of organic frameworks used in pharmaceutical nanotechnology. An up-to-date overview of organic smart nanocarriers is explored, along with the different types of nanocarriers, including polymeric micelles, cyclodextrins, hydrogels, lipid nanoparticles and nanoemlusions. 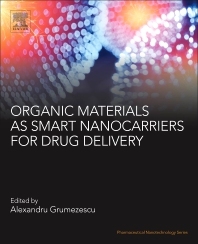 Written by a diverse range of international academics, this book is a valuable reference for researchers in biomaterials, the pharmaceutical industry, and those who want to learn more about the current applications of organic smart nanocarriers.